Manchester United have become the latest club to launch their new kit, the first of a record-breaking deal with Adidas worth £75m a year. United announced the 10-year contract in July 2014 but could not release the kit until a 13-season deal with Nike, worth £23.5m a year, expired. 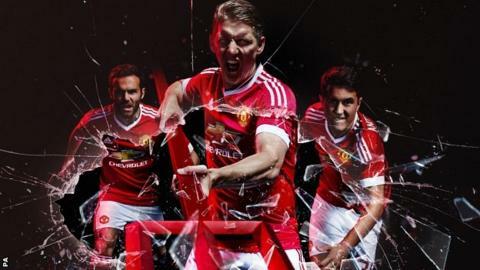 It is the first time Adidas has made United's strip for 24 years, with the club saying it was a "classic design". Chelsea and Liverpool are among other clubs to introduce new strips. United group managing director Richard Arnold added: "Everyone at Manchester United is very proud of the shirt, which draws upon the club's iconic kits of yesteryear." Louis van Gaal's team begin the new Premier League season at home to Tottenham on 8 August and will return to the Champions League this season after missing out in 2014-15 for the first time in 19 years. Liverpool have also changed suppliers for the coming season, opting for New Balance in a deal reported to be worth a record £300m. New Balance are the parent company of previous manufacturer Warrior. Premier League champions Chelsea remain with Adidas but have also launched a new kit. In 2013, they signed a 10-year deal with the sportswear company, reported to be worth £300m. New shirt sponsor Yokohama reportedly pays Chelsea £40m a year. Eden Hazard shows off the new Chelsea home kit, which the club says "includes a truly unique feature, a finger print woven onto a label on each shirt"
Arsenal's new kit is the work of German manufacturer Puma, which took over from Nike last year. Midfielder Santi Cazorla says the design is "classic like an Arsenal kit should be, with some very nice design features". Manchester City are the only member of the so-called 'Big Five' with American sportswear giant Nike. The new kit sees a return to the white shorts that were part of the ensemble when City won the Premier League in 2013-14, with last season's sky blue shorts discarded. Norwich have continued their association with Italian manufacturer Errea for their return to the Premier League, but the collaboration has not been to everyone's taste. The club's new third kit has proved particularly controversial, with the club's head of retail Steve Balmer-Walters admitting: "Fans will either love it or hate it." Man Utd US tour: What did we learn? Read more on Manchester United's US tour: Who impressed? What did we learn?